Turning around struggling high schools is the toughest work in education reform. Research found that a $3.5 billion federal program meant to fix the nation’s lowest-performing schools — which focused disproportionately on high schools — did little to improve student achievement. In this ongoing series, The Hechinger Report is visiting high schools that have beaten the long odds to learn what’s behind their success in improving graduation rates and sending more students to college. TULSA, Okla. — The first thing you notice during morning arrival outside Daniel Webster High School is the cluster of red-jacketed young adults, each holding up a sign identifying their favorite hobby. They’re members of City Year, a nonprofit partner of AmeriCorps that recruits college-age members from across the country to serve as tutors and mentors in high-poverty urban schools. 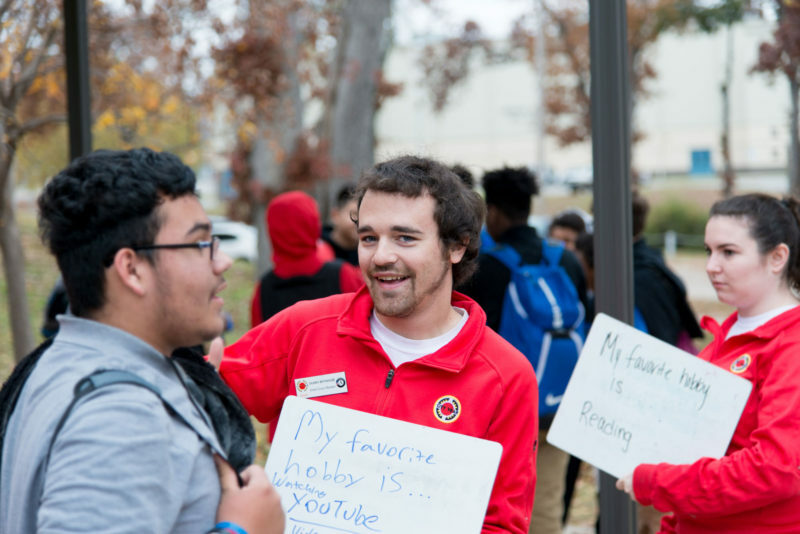 Many of the Webster upperclassmen simply walk by the City Year members, but several younger students stop and engage in conversations about a shared love of video games or binge-watching YouTube clips. 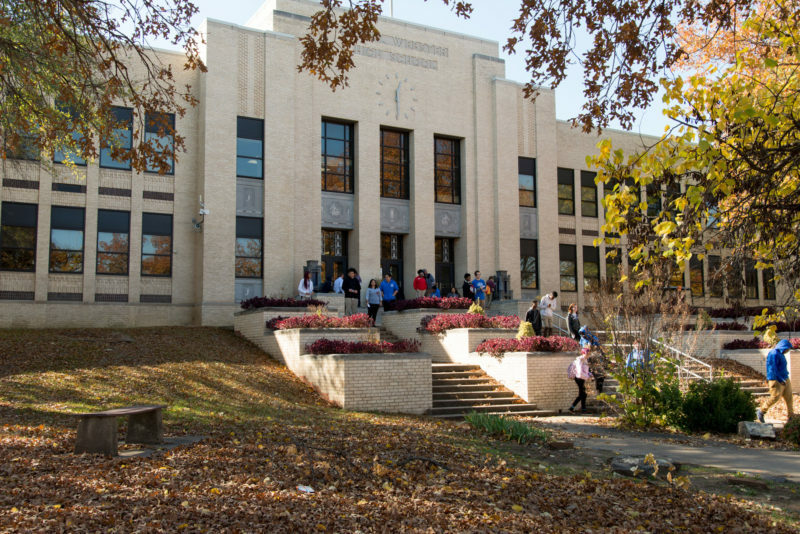 Webster High School, just a few miles from downtown Tulsa across the Arkansas River, serves the city’s Westside community in which only 15 percent of adults have a bachelor’s degree or higher and 10 percent of residents are unemployed. Nine out of ten students at Webster qualify for free or reduced-priced lunch, a national measure of poverty. As in many schools where poverty and homelessness are daily realities, test scores at Webster have lagged behind statewide averages. But an even bigger struggle has been keeping students in school. By 2013, Webster managed to graduate just 53 percent of its students, and it was clear to school and district officials that drastic change was in order. “The need to focus on graduation rates was pretty obvious,” said Tulsa school superintendent Deborah Gist. With school budgets already limited by a conservative-led state legislature that critics say chronically underfunds public education, the district turned to Diplomas Now, an education nonprofit whose aim is to increase graduation rates using a data-driven system of early intervention. The results have been impressive. According to data provided by district officials, in spring 2016 (the most recent year available), Webster graduated 75 percent of its seniors, a 22-point increase in just three years. Under the umbrella of Diplomas Now, three separate organizations, each independently staffed and funded, operate on Webster’s campus. City Year, with its team of 10 corps members, is the most visible. But Communities In Schools, a Virginia-based nonprofit, is a vital pillar of support that directs students and families in need to community resources. 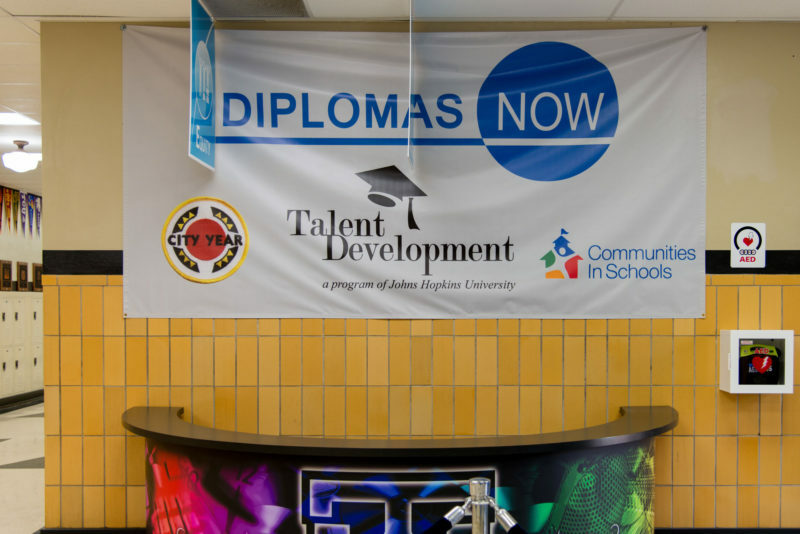 Talent Development Secondary, a nonprofit that grew out of a Johns Hopkins University study on dropout rates, is the data-driven arm of the Diplomas Now model; it identifies kids at risk of dropping out and establishes a schoolwide process of intervention and support services to keep them on track to graduate. Getting kids to share this type of information is the first challenge. At Webster the emphasis among each of the partner organizations is to establish individual relationships with students. City Year’s members, all between the ages of 17 and 24, serve as “near-peers” and provide one-on-one tutoring, host afterschool programs and sit in on every ninth- and 10th-grade math and English class, in an attempt to create the open lines of communication with students that teachers don’t have the tools or resources to facilitate. “If a kid is having a crisis at home that day,” said math teacher Julie Skrzypczak, “maybe they confide in the City Year member whereas they just come into my room angry.” Sometimes, she said, all it takes is for the City Year member assigned to her class to go take a walk with the student for a few minutes of conversation, and the student returns to the classroom ready to learn. 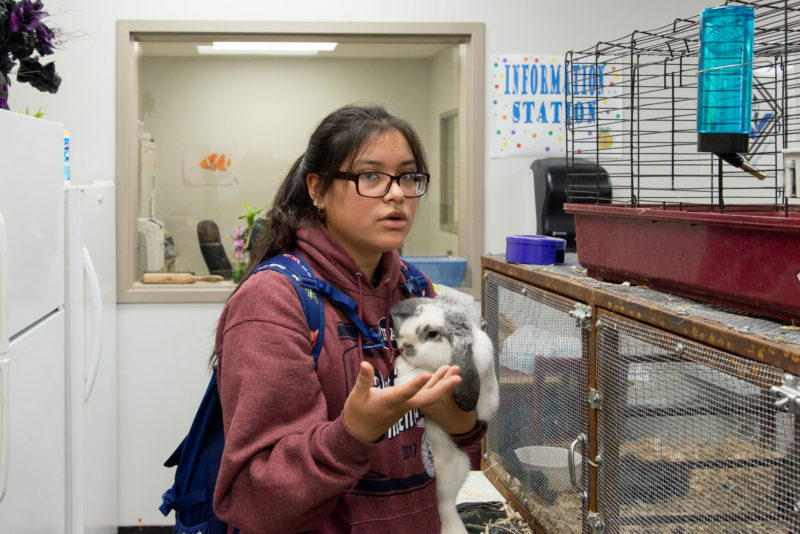 Rowland can provide access to community and city resources to address problems like homelessness, abuse and mental health needs, but can’t do anything without first gaining the trust of students who may be too ashamed to ask for help. “Kids have to know that you care before they care about what you know,” he said. Even in stable households, Rowland added, many of Webster’s students will be the first in their families to graduate high school. Tasks like visiting college campuses or filling out financial aid forms are going to be brand new for parents and students. Every Monday, Webster principal Shelly Holman and her staff hold meetings with representatives from City Year, Communities In Schools and Talent Development Secondary. Together they review a list of students for whom the data indicates a dropout risk. Collectively, the team puts into place a plan to reach out to these students, find out what nonschool challenges they’re facing and make referrals to get the students and/or their families the resources they need. Sharing data with outside organizations, let alone adopting feedback from adults who aren’t even under your employ isn’t business as usual for school officials. The partnership that’s developed at Webster requires a leap of faith from both the administration and the faculty. But Holman is quick to note the practical upside to bringing in outside partners. “Diplomas Now has given us the boots on the ground to work with these kids individually. 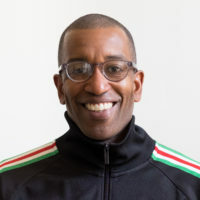 We can take the load off of our teachers who are under the pressure of meeting the academic standards so that we aren’t a failure factory,” the principal said. Webster’s success, however, isn’t about outside groups coming in and magically solving a long-standing problem on their own. Shortly after she became principal in 2013, Holman instituted additional learning time during the school day by scheduling classes in 85-minute blocks, double the time allotted in other Tulsa schools. Cutting down on the time students spend in hallways moving between classes has gained an additional 20 minutes of instruction time per day, school officials estimate. The extended class periods also mean that students can earn a course credit in one semester rather than over a full school year. For high-performing students, that can mean beginning college a semester early. And those with an interest in vocational training can take advantage of several internships Webster provides once their graduation requirements have been fulfilled. Holman and her staff have been dogged in their efforts not only to keep kids in school, but lure back the ones who got away. For the second year in a row, Holman and a team of teachers and administrators went door-to-door through the neighborhood in early September, tracking down kids who appeared on their enrollment list but hadn’t shown up. It’s not an easy task. Noting the community’s more transient population, assistant principal Ryan Buell said they rarely locate a student on the first attempt, and when their van pulls up at an address, with several officials piling out, they’re sometimes mistaken for law enforcement.